While the spaces are not huge, they are generous and comfortable enough for a young family. Check your email for all the details. Hi, can I get details for this house plan please. I have sent you details for the 2 house plans via email. Please revert back so that we can discuss further. i have a 50*100 plot in ongata rongai. my main aim was to build a maisonette with roughly 2m budget. kindly advice. is the budget within range or is it little. roughly how much is it going to cost for a maisonette. can i also be staying inside while construction is going on. •	Build your home in phases e.g. work on the structure first and do finishes slowly, one room at a time. Yes you can occupy your house as long as the structure is finished and continue working on the finishes. Kindly not that there are other costs for you to put in your budget. I would like to consider building in bits and possibly occupying two rooms first and continue with finishing the others. How much would it cost to have this kind of plan plus quantity of material for the various phases of construction. I have land in maseno but would like to use cheaper wall material. We work with our partner Quantity Surveyors to prepare a bills of quantities. This is the document that will specify all the materials plus quantities required to achieve a given construction. I have sent you more details via email. 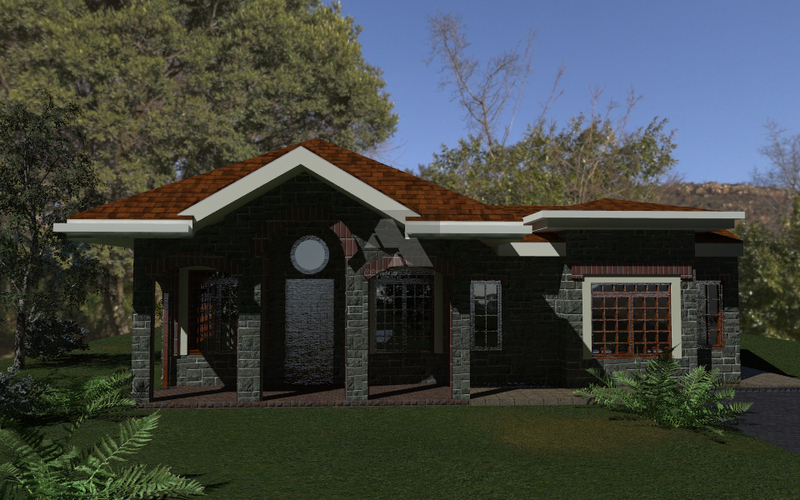 The cost of construction for this house plan would be between 3M-3.2M. Please note that the cost varies depending on the finishes selected and the location, which affects cost of materials and labour. Check your inbox for more details. Your designs are very impressive. Am planning to build a similar unit at home. I would like to know how much you charge for such a plan. Secondly i have an obsession for those breathtaking sloping complex roofs. I believe it’s the roofing design that makes a house stand out. Kindly let me know if you also do roof designs, and should you have such kind of sample roofing for my perusal. Thank you for your inquiry. We can make adjustments to the roof to make it fit your needs. Indeed there are many roof designs and all we need is to agree on the style of roof you want. I have sent you an email with all the other details on the house plan. Awaiting your response. I was really impressed by your house designs, especially the three bedroom ones. I have a plot of 100 by 50 but I intend to utilize only 50 by 50 for a three bedroom bungalow house with master ensuite and a garage for two vehicles in Kanamai , Kilifi County . Kindly advise on the best design , the duration it may take to complete and the average amount that I need to put aside for such a house for my family. Check your email for our response. what would be the cost of putting up such a house in a village set up like Kitale? I have sent you all the costs that you need to consider to put up this house plan in any part of the country. Thank you for getting in touch and I await your response. Check you email. I have sent you all the details. Do you have a plan with the following, its one story residential house. 2 other Bedrooms Sharing a Bath to be on down stairs. Kitchen enclosed with a store next to it. My budget is about 2M, and location is Nakuru. Thanks Geoffrey for getting in touch with us. Yes, we can design a house plan for you based on the details you have given. I encourage you to visit our offices so that we can start off the project and discuss in more details what you want. I have sent you more details via email. I await your response. Hey David how much is this plan? Kindly check your email for all the details. Thank you for getting in touch with us. I have sent you an email with some sample 3 bedroom house plans as well as information on how to get a plan from us. Kindly revert for further discussions. I have sent you an email with the same details. Looking forward to hearing from you. I totally depend on the size of the house. The standard cost of building currently is between KES.25,000 – KES.35,000 per square meter, according to the latest published rated from the Institute of Quantity Surveyors of Kenya, depending on finishes and location of the project. Using these rates, you can multiple with the total size of the house to get an approximate cost of each house plan. The Concise 3 Bedroom bungalow is 115m2, therefore, using these rates, the approx. cost would be 2.875M-4.02M. I hope this gives you an idea on how to figure out the approx. cost of construction. can I get this plan? I hope you got my email. We can easily add a back door as you have requested at no additional cost. Greetings,Where are your offices and how can i check on ur designs so that i can settle for one. Hi David, kindly share this with me too. Thanks. In our professional experience, we have seen that a bungalow will cost about 200,000-300,000 less than a maisonette. Note that for a bungalow you will save because the foundation and reinforcement is lighter because you do not need to support upper levels. For a maisionette, there is also the added cost of slab at upper levels. However, for a bungalow you will end up with a bigger roof which will cost a little more than a maisonette. More details sent to you via email. I was really impressed by your house designs, especially the three bedroom ones. I have a plot of 100 by 50 but I intend to utilize only 50 by 50 for a three bedroom bungalow house with master ensuite and a garage for one car in Gilgil, Nakuru County . Kindly advise on the best design , the duration it may take to complete and the average amount that I need to put aside for such a house for my family. We have several house plans that you can consider and we can make adjustments to make the plan fit within the 50*50. Kindly check your email for all the details. Kindly check your email for all the details regarding this house plan. Hallo,I would like to build a simple sizeable three bedroomed house for less than 1m in the village.so I need a living room, shared bathroom,kitchen,open verandah ,master bedroom and 2 other bedrooms. I have a plot sized 40*60, and would want to build a 3bed-roomed bungalow [ 1 master Ensuite], kitchen with a store, living room with a dining area, Garage in Kiambu county. Kindly check your inbox for all the details. You can fit a house within a 50*50 piece of land but you will not have much space around it. Hopefully in Mumias or Kitale, you might not need county approvals. I have sent you an email with more details. I am planning to build a 4bedroom house (1 master ensuite), 2 W/C and bath (2 bedrooms sharing and the other common). The dinning adjoining to the sitting room and an open plan kitchen (with pantry) using standard finishes. I am also considerating having a porch at the entrance and a laundry area exiting the kitchen. Kindly advise on the cost implication. Kindly find all the details in your inbox. I await your response. Greetings, I would like to build a three bedroom house, master ensuite with a parking, plot 40 by 80 either mansionette or bungalow in Mutalia along Kangundo road with a budget of under 2.5. Kindly advise. The choice between a bungalow and a maisonette will depend in your budget as well as the requirements given by the county government, given that the piece of land is not very big. 2.5M is a good budget to start with. You will be able to go a long way in your construction and even move in. The few things that you may not have finalized and be worked on over time as money becomes more available. More details sent via email. Yes indeed, we can work with the photo you have and recreate the house plan to your exact specification. What I suggest is you send us the image that you have and from there, we can map out a way forward, including the cost associated with it. I have sent you an email with more details. Awaiting your response. i would like to build a 3 room bungalow /maisonette on a 50×50 piece of land leaving space 2 vehicle packing,what designs do you have and the cost if i intend to use panels? We do make changes to the house plan to ensure that each client is happy with the layout of the house and the associated sizes of the rooms. I have sent you an email with all the details. Awaiting your response. 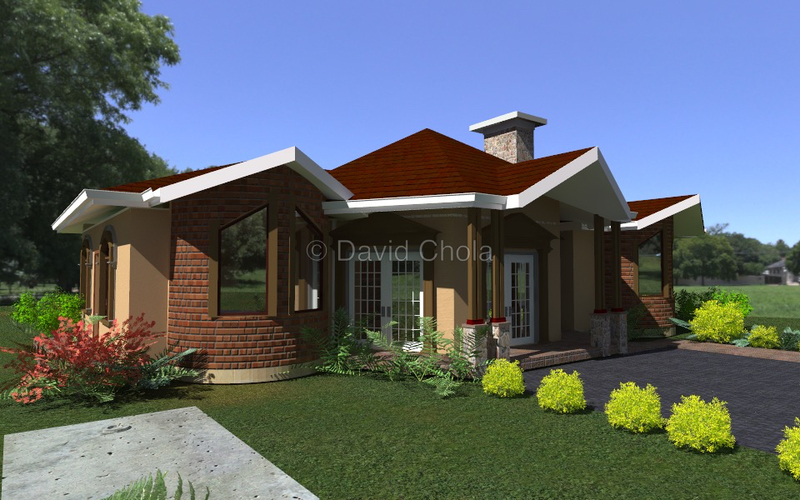 Hi David, I am very impressed with this bungalow and I would like to do an exact one in Thika. However, my plot is 80 by 40. What are my options, the cost of Building it in Landless Estate, Thika, and the requirements of getting all the architectural and structural specifications. Your email has been well received. I have sent you an email with all the details. I await your response. I have sent you more details via email. Awaiting your response. – I like the alternatives for the locking bricks and EPS panels. Most of your queries fall under electricals and plumbers, meaning for your project we need to bring on board a Services Engineer. Kindly check your email for more details on the whole project. Would like to get a nice house plan and construction cost for three bedroom bungalow., one being master. The house will be constructed in the village and looking at using coral rocks for walls, coloured box sheets for roof, tiles on the floor, two entrances, two balcons one of them at the main entrance and the other on the master bedroom. I need a good looking and modern design. Can I please have the house plan of a 4 bedroom bungalow the total cost of putting it up in a village setting bt a modern design or maybe the total cost of the above. The cost of constructing a house basically depends on the total size of the house. The standard cost of building currently is between KES 25,000 – KES 35,000 per square meter, according to the latest published rated from the Institute of Quantity Surveyors of Kenya, depending on finishes and location of the project. If a four between house is say 120m2, that would cost between 3M-4.2M using these rates. Of course you can still do a lot to bring the cost down depending on choice of materials, good construction practice etc. I have sent you an email with more details. The cost of constructing a house basically depends on the total size of the house. The standard cost of building currently is between KES 25,000 – KES 35,000 per square meter, according to the latest published rated from the Institute of Quantity Surveyors of Kenya, depending on finishes and location of the project. There are still many ways that you can use to bring down the cost of construction. We usually advice our clients to start with what they have in hand. You can easily build the structure of your home and even get some finishes fixed with the money you have. Once you move in, you can work on the rest of your home slowly as funds become more available. So don’t let your budget stop you. You may take a longer time to build your home but you will get there eventually. The cost of constructing a house basically depends on the total size of the house. The standard cost of building currently is between KES 25,000 – KES 35,000 per square meter, according to the latest published rated from the Institute of Quantity Surveyors of Kenya, depending on finishes and location of the project. If a four between house is say 100m2, that would cost between 2.5M-3M approximately using these rates. Hi David, I want to build a 3 bedroom house on a 50*100 plot in Webuye; master ensuite, 2 bedrooms sharing a bathroom, living room with dining area and kitchen. My budget 900k. Is it possible? Kindly revert. Regards. Thank you for getting in touch regarding your construction project. Now, 900k will probably not be able to build you a house as described with traditional construction i.e. stone and mortar. You can consider using materials such as soil blocks, containers, mabati and so one to bring down the cost as well as simplify your requirements and keep your finishes very simple. That way you can be able to put up the structure of your house and the essentials to allow you to move in and then you can continue working on the house and finishes slowly as funds become more available. This is fantastic. Can I get more details on estimates and dimensions. Check your email for all the details regarding this house plan. looking forward to set up such a hse in busia. Get in touch with us when you are ready and we work help you achieve your dream! Hello.impressive. Do you have a cost breakdown for this house? I have sent you a message via email with all the details. Awaiting your response. 4. Build your house in phases. Your budget can allow you to build your structure and a few finishes, taking the house to a place where it can be occupied. With time, as more funds become available, you can continue working on finishes, e.g. tiling, cabinets, painting/wall finishes and so on. Kindly check your email. I have sent you the details. The standard cost of building currently is between KES 25,000 – KES 35,000 per square meter, according to the latest published rated from the Institute of Quantity Surveyors of Kenya, depending on finishes and location of the project. If a three bedroom house between house is say 100m2, that would cost between 2.5M-3M approximately using these rates. Kindly check your email for all the details on three bedroom house plans. Please check your email for all the details regarding this house plan. Kindly check your email for all the details. Thank you for considering our services. I would like to know more details of the above House. And if roofing can be customized. We do make changes to the house plan, including customizing the roof design to fit the needs of our clients, as long as those changes are reasonable and do not essential lead to total redesign of the plan. Please check your email for all the details on this plan. Kindly send me more details about this plan. I have sent you a detailed response via email. I await your response. Impressive work. Send me details of the above three bed-roomed house. Love this design. Could I get the costs and plans as well? Email sent with all the details. Kindly give me the cost of bungalow with its yard . Located at Nmanga Town. Hi David.have a plot 50 by 100 and want to construct a 3 bedroom house,excactly your design. how much do u charge for design and whats the estimated cost of building at nmanga. Please check your email for all the details. Hi how much is drawing me an architecteral plan for a 3 bedroom maisonette in joska ? I have a land of 50 by 100 and would like to build a 4 bedroom massionette. How much would you charge for the design and what’s the estimated cost of building at Sabaki – Mombasa rd. Do you view the plots for further advise? Kindly check your email for all the details on this house plan. Impressive. Looking for some advise on construction costs. Do I post my question here? i have a 50 by 100 plot and am interested in building a simple 3 bedroom house. Kindly send me all the details on three bedroom house plans and its costs. I would like to put up a similar bungalow in Koru. Please guide me on dos, donts and the costs. Costs should also include the plan. Please check your inbox and find all the details. I like the design, can I get a 4bedroom of the same design? A 50*100 piece of land is adequate for this house plan, leaving you with enough space all around. Please check your email for all the other details. Can a 30 by 60 accomodate 3br bungalow and at least leave a space? You can definitely get a bungalow house to fit within a 30*60, however the house will be small and space around will be a challenge. I suggest you consider a maisonette which has a much smaller foot print, allowing you to leave a bit more space around the house. Going up also allows you to build a much more spacious house. Most people worry that a maisonette is more expensive, but the space save is worth the different in cost. I have 50 by100 plot and interested in building three bed room house. Kindly send me detail on three bedroom house plan and costs. A 50*100 piece of land is more than adequate to construct a 3 bedroom bungalow and leave adequate room all around. Please check your email for all the other details. The standard cost of building currently is between KES.25,000–KES.35,000 per square meter, according to the latest published rated from the Institute of Quantity Surveyors of Kenya, depending on finishes and location of the project. This house plan is 115m2. Using the rates provided you can budget between 2.875M-4.025M. Being that you want to build in the rural area, you can definitely bring the cost even lower. Please send me more details on this plan. Email sent to you with all the details on this house plan. I await to hear from you. Check your inbox for all the info on the Concise 3 Bedroom House Plan. Awaiting your response. I hope you received my email with all the details on this plan. Awaiting your response. Hallo. Am looking to build a 3 bedroom house (bungalow) in the village. I don’t have a plan, but am thinking of something like this: one master bedroom (with a bathroom), 2 bedrooms (with a shared bathroom), living room with an adjoining dining room, a front porch, and a kitchen with a balcony. And how much do you charge for house plans? We can design a plan for you if none of these work. Check your email for more details. I have sent to your inbox all the details on this house plan. I wait to hear from you and thanks for getting in touch. Am Everlyn I need to build a 3 bedroom house in limuru how much does the plan cost? Please check your inbox for all the details concerning the Concise 3 Bedroom House Plan. Cost of building such in up country? The standard cost of building currently is between KES 25,000 – KES 35,000 per square meter, according to the latest published rated from the Institute of Quantity Surveyors of Kenya, depending on finishes and location of the project. This house plan is 115m2. Using the rates provided you can budget between 2.875M-4.025M. Building up country can bring the cost of construction down depending on cost and availability of materials and services. The simpler your finishes the less your construction cost. I have emailed more details to you. Yes, we can adjust the plan to make 2 of the rooms en-suite. Check your inbox for all the details. Niforwadie hii email umetumia Kate Cephas…. I need the same thing. Check you email for all the details. Can I build two houses on such a plot 3 bedroom and another next to it 3 bedroom? The size of land you have. Is the land enough for the 2 houses? Location – If you are building in an area that requires county approvals, then it will depend on the regulations set by the county. They may or may not approve it depending on the laws of your area. would like to construct a maisonette in a plot measuring 33 x 66 around eastland Nairobi. Is it possible? Hi David, I have a sketch of a 3 bedrooms and a garage and i would like you to do me a plan. My plot is 100*100 situated in Bungoma town. Kindly advice. We can definitely use your sketch to come up with a house plan for you. Kindly check your email for more details. I am interested in this design. What is the approximate cost for a a shell and then finishes can be done later while occupied. For a simple house plan, the structure takes 70% of the cost while the finishes cost 30%. You can definitely work on the structure, move in and work on the finishes later. With 50*100 and a budget of 3.5- 4 m ,can I get a spacious 4bedroom bungalow with only master ensuite and common bathroom & toilet. Or can a maisonettes with same number of bedroom,master ensuite,common toilet & bathroom fit in this budget?send me design ideas and cost. I have sent you all the info via email. your work is impressive, especially on this house. Yes, we can help you with the approval process for this house plan. Kindly check your email for more details on how to get the plan. Check your email for all the details Dorcas. Hi David, i have a 50 by 100 plot and i needed to put up a 3 bedroom house for my family, just like the obe have seen above, what do i need n the cost for building it. Do you have any house plan and roofing designs for a house with one room upstairs. Kindly select some for our further discussion. I have sent you some details. I am interested in the plan. Do you have other simple plans for 3 bedroom bungalows such that i can make selection; I need to put it up in Mavoko Area; Athi River on a 50*100 plot, how much would it cost me. Estimate. I love this design.how much would it cost for all the plans for it.Also is it possible to do modifications based on my preferences. Yes we do customize our plans to the needs and budget of each client. More details sent to you via email. Impressive! What’s the cost for a simple 3 bedroomed bungalow house plan? How do I present my paper drawing for what I have in mind? Kindly brother, send me few designs of a 3 bedroomed bungalows including their approximated cost of constructing. Thanks. I need to put up something but I need to have an idea before I now engage you for biz. I have a plot in Kamulu 40*80 and i am planning to build a three simple bedroom house with kitchen and washrooms inside. How much should i budget for? We can definitely provide you with a plan that has the features stated in your comment. Kindly check your email for all the details. I plan to build a 2story building in Nanyuki in a 50*100 piece of land my budget is 1.9m advice if it’s possible and also how I can minimise the cost but end up with a porch house. 4. Build your house in phases. Your budget can allow you to build your structure and a few finishes, taking the house to a place where it can be occupied. With time, as more funds become available, you can continue working on finishes, e.g. tiling, cabinets, painting/wall finishes and so on. This is the best way to build a good home with a tight buget. You will spend more but give yourself more time to get there. 5. A simple bungalow house plan will not require any structural design. I plan to build a 3 bedroom bungalow on a 40×100 plot at lower Kabete. 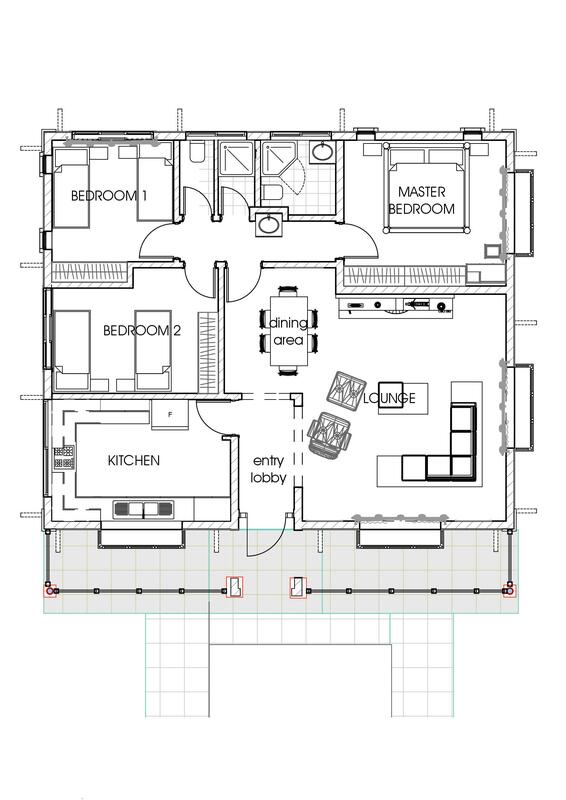 My idea is to have 1 master bedroom (spacious enough) and 2 sharing one bathroom. Next to the Kitchen, I would like to have a store. A garage for 1 car and the rest of the space I would build an outside bathroom/shower and the rest I would make a garden and flowering area. I love flower gardens. Do you have such a plan and how much is the estimated cost of building. I love unique roofing ideas and you may consider this. I hope you got my email with all the details. Check your email Arnold. I have sent you all the details. I have sent you all the details. I love the designs. Thanks for sharing. I am interested in a simple and small 3 bedroom design on a slightly sloping 1/8 acre land. I would like the kitchen to have a store area section. One master ensuite, two bedrooms with shared bathroom, seating and dining area and front and kitchen porch. Kindly advise on costs and design. Kindly check your inbox for our detailed response to your query. All the details have been forwarded to you via email. I have sent you an email. Awaiting your response. 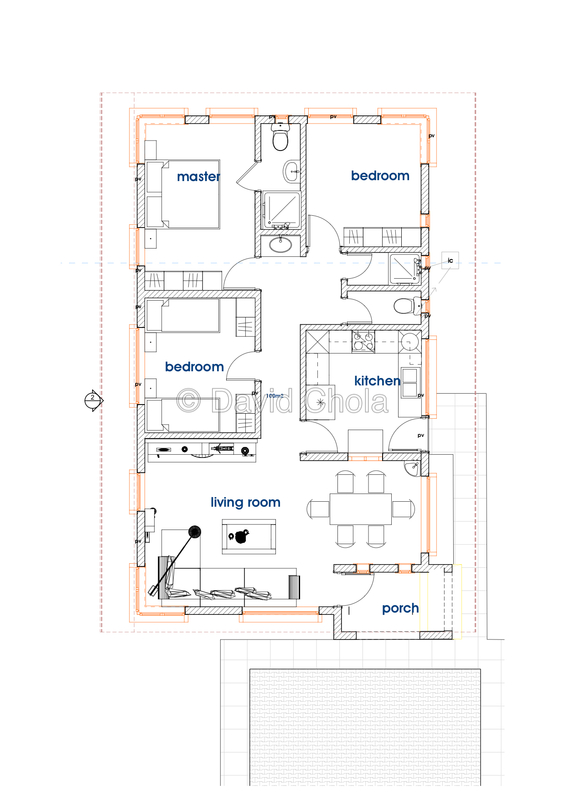 We have several 3 bedroom house plans on our site that you can consider. Take a look at a few by following this links. I have sent you more details via email on house you can get a plan for yourself. 3 other Bedrooms Sharing a Bath to be on down stairs. My budget is about 3M, and location is Marsabit. I hope you got my email yesterday. I have attached some sample plans for your consideration. hi David kindly send me the whole planning and the sizes for each room and the total cost. Check you email for all the details on this house plans. -Estimated cost for the design including authorities costs. -Estimated cost for building the entire house. -Duration it may take to complete the construction should all factors held constant. I have sent you a detailed email answered all your questions. How much is the plan. Check you email for a detailed description, answering all your questions. Would you kindly send the Details of The Concise 3 Bedroom Bungalow with measurements to my E-Mails modero@usl-kenya.com. I have sent you all the details via email. Hi David, kindly send me details of cost of construction of a medium mansionatte and bungalow in kiambu. I have sent you a detailed email with some sample plans and costs. I have sent you different 4 bedroom sample plans to look at as well as more information. 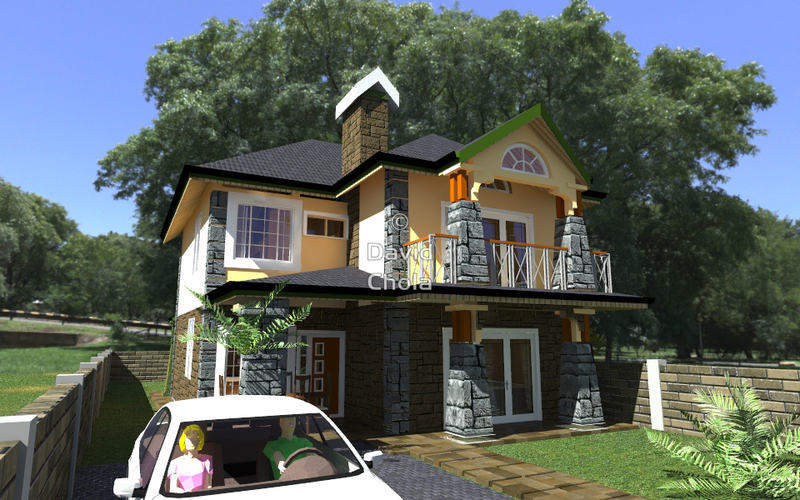 Hi David, I was looking for house designs when I found this page great work.How much would it cost to build a 4 bedroom house maisonette on 50 * 100 in Nakuru.design,BQ cost of building. The standard cost of building currently is between KES 25,000 – KES 35,000 per square meter, according to the latest published rated from the Institute of Quantity Surveyors of Kenya, depending on finishes and location of the project. If you build a house of say 160M2 you can estimate the cost of construction to be between 4M-5.6M. Hi David, thank you for guide to would be builders. Would you please provide me with a sample plan for a mansion of 4 bedrooms one downstairs. I have a budget of kshs 3.5m . Approximately how much do I need to occupy it before completion coz I don’t have enough funds now. Whose approvals do I need for construction to commence? You will definitely need approvals from the county government to construct a maisonette. This requires at minimum architectural and structural drawings. Check your email for more details and thanks for getting in touch. The standard cost of building currently is between KES 25,000 – KES 35,000 per square meter, according to the latest published rated from the Institute of Quantity Surveyors of Kenya, depending on finishes and location of the project. If you construct a home of say 140m2 and even use a lower rate of 20,000 per M2, given that you building in the rural area, you can budget between 2.8M. Kindly check your email for more details. Check your email. I have sent you all the details. The standard cost of building currently is between KES 25,000 – KES 35,000 per square meter, according to the latest published rated from the Institute of Quantity Surveyors of Kenya, depending on finishes and location of the project. Using this rate, if you build a house of say 100M2, it would cost you between 2.5M and 3.5M. Keep in mind there are many factors that affect the cost of construction and the rate given is pretty comprehensive. The location of the project will also affect the cost of construction. Now, the structure of the house takes about 60% of the construction cost. So if you were to keep the total construction at 2.5M, then with your 1.5M you will be able to finish the structure of the house. You can then proceed to deal with finishes slowly as funds become available. This is actually the best way to undertake construction when on a tight budget. More details in you inbox and thanks for getting in touch. I have sent you the break down via email. Waiting for your response. A BQ can definitely be arranged. I have sent you all the details via email. Hello am really impressed and this is the site I have been searching for. I need to get in touch with you via email. Here are our contact details as well as our location. I sent you an email with details on this house plan on the 9th of January. I have resent that message, awaiting your response. Please check your email. I sent you details and sample house plans. Let me know if you got it and please check the spam folder. Great work. I will consult you soon. I’m impressed. Thank you for your kind comment. Get in touch with us when you are ready. We will be happy to work with you. Hi David, I want to build a 3 BR master ensuit bungalow in Katani. What are the different designs and how much do you charge for blueprints? I have sent you links to various house plans. Check my email and get in touch. I hope you got my email. I wait to hear from you for further discussions. I have sent you some sample plans, both bungalows and maisonettes. I have included details on each and how to get a house plan from us. Kindly David send me details of 3 bedroom bungalow n approx cost Nakuru. Its 2.3 M enough for a 3 bedroom mansionate ,in a plot of 50 by 100 at Joska Kangundo road . Can the cost be lowered without compromising quality .Kindly respond. With a tight budget, you may want to consider a bungalow house plan which will cost a little less to construct. Check your email for more details. All the details regarding this house plan have been sent to you. Hello, What is the cost of a house plan for a one Storey house with one bedroom on ground floor and two bedrooms on upper floor.with car park attached on one side. Have a look at some of your plans that fit your description. I like the simple 3 bedroom plan David. What would be the average cost of such if one went with average finishing? The standard cost of building currently is between KES 25,000 – KES 35,000 per square meter, according to the latest published rated from the Institute of Quantity Surveyors of Kenya, depending on finishes and location of the project. This house plans is 115M2 , therefore using the rate given above, the approximate cost of construction is 2.875M-4.025M. Keep in mind that a lot of factors affect the cost of construction but the rate given above is pretty comprehensive. I have sent you more details on how the get the plan. I wait to hear from you. The plan is very impressive. Kindly share more details on it. I have sent you details on this house plan and how you can get it. The plan is very impressive. Would like more and finer details on it. I hope you got my email. I sent you all the details on this house plan. Interested in a 3 bedroom design back at rural home. The kitchen to have a store,a master en-suite, two bedrooms with shared bathroom, seating area and front and kitchen porch. Please send design/plan and cost. Thank you. I have sent you some sample house plans for you to look at. We can adjust the plans to suite your needs as you have described. Kindly revert back for further discussions. Hi David. This is really good. I need a simple 3 Bed design master ensuite and one bathroom sharing. Kitchen with store area. Front entrance to the house to have a porch sitting area and then a back entrance to the house too. Check your email. I have sent you all the details. I await your response. We have several house plans on our site that you can consider. Keep in mind that we can customize the design of any plan to fit within the description in your comment. Kindly revert to our email for further discussions. Check your email. I have sent you some sample house plans as well as tentative construction costs. I have sent you some sample plans to look at. I have also given you additional info on how to get our house plans. Get in touch for further discussions. I have sent you a detailed email. Am much impressed by this design. My dream has always been a 3 bedroom master en-suite bungalow. What is the approximate cost of such a house in Meru? can i get a plan of such?. Thank you for your kind comments. Kindly check your email for all the details. Check your email for all the details. Yes, we can adjustment plan for you to make it more spacious. We can also help you identify the right contractor to work with you on the construction. I NEED THE 3 BED ROOM PLAN SELF CONTAINED TO PUT ON A QUARTE PIECE OF LAND IN KIKAMBALA AND SPACE TO PARK 2 CARS AND AN SQ ANY ADVICE AND COSTING OF BUILDING AND ARCHITECT. Check your email for all the details. I have sent you some sample plans and details on how to get a house plan.